When I think of a place I miss the most, Yogyakarta comes up into my mind. That place fills a special place in my heart. Yogyakarta brought back every memories of me with a lot of people. Yogya has its own quality that made me want to live there. If I have to describe Yogyakarta, I’d say it’s sacred yet beautiful. I like the fact that it still heavily under influence of traditional belief. It was the month of May of 2017 when I went to Yogyakarta with my family—Mom, Dad, my sister Icha. I’ve already visited Yogya 3 times so far. The first one was with my relatives—I can’t recall what year it was, this—the one with my family, was the second one, and the third time was the most recent one in 2018 with my close friends. However, the second visit made me fall in love with the city and also realized that I have so many things to be thankful for. Especially that night… in Malioboro. We originally planned to visit a lot of Yogyakarta’s famous tourist spot, but we only managed to visit some, because little did we know, Dad wasn’t in a good shape at that time, considering he had already stopped the chemotherapy. Yes, Dad had lymphatic cancer, but instead of continuing the chemotherapy, he stopped doing it because he really wasn’t fond of the chemical reaction. “I’d rather live with my cancer eating me out slowly. It’s not the cancer that’s killing me, it’s the chemo”. So on the last night in Yogyakarta, we decided to stroll around Malioboro because we couldn’t risk dad’s health. We walked out of the hotel we were staying in on one of Malioboro’s alleys after Maghrib to look for dinner. Dad said it was culinary time. As we walked out, there were people who offered becak and delman ride to the main street. I was sure becak and delman were the main transportations in Malioboro street, because of the heavy traffic caused by too many cars and motorcycles. However, we decided to walk. The alley was full of kinds of hostelry—hotel, motel, cabin, you name it. There were also café, bars full of foreigners, and also people selling all kinds of food. Ranging from wedang jahe, rabbit satay, up to angkringan—a push cart that sells traditional food, small portion of rice and mostly chicken offal where people eat while sitting down on the ground, over a mat, of course. The alley felt rather quiet and calm compared to the main street. It felt like the main street never sleeps. Even the street vendor—the ones that sell clothes, souvenirs were closed while the ones that sell food were still open until dawn. Most of the cars and motorcycles were parked on the side of the road, making it more narrow than it already was. We walked along the side road while still looking for food to eat when mom stopped watching street band that played best karaoke hits. The band consisted of five personnel. Two of them were the vocals, a man and a woman. They were the more high budget street artist because they used big sound systems, compared to the other street artist that only used guitar and portable drums. My mom and Icha seemed interested, while dad and I weren’t, so we sat on one of the bench when he abruptly tapped on my shoulder and said that I have the same kind of shoulder as he does. “It’s broad” he said. I nodded without saying anything while looking at the woman who was grilling satay which I believe was rabbit meat, near the giant road side plant vase. It was something my dad always told me over and over again up to the point that I’ve memorized every word of the sentence. We then decided to eat gudeg, a mandatory dish if you visit Yogyakarta, when we already tried the Yu Djum one. This vendor was selling more variations of gudegthan Yu Djum, and they display the food out on basins for people to choose without having to look at the menu. We only ordered a portion with a little bit of everything, because again, it was culinary. Frankly, we all agreed that Yu Djum tasted better than this one, and so we went on searching for other food vendor that was more appetizing than the previous one. We came across a seafood vendor which was packed with people. For tourists like us, we looked for vendors that are crowded, hoping that we went to the good one. When we were waiting for our food, a street artists with guitar and cello started to sing their anthem near our table. For the record, dad liked singing, so he asked them to sing more of his own song request. He stood up and sat on the bench in front of our table, crossed his legs up and started to sing lively. Then they sang the song.. the song that reminded me of this place and this particular moment. “Yogyakarta” by Kla Project. This is hard to imagine, but when this song came up, everybody were singing, even when they were in the middle of chewing their food. Malioboro was always loud, but, in my head, this moment was louder. While we were eating, a young lady carrying a milking baby on her chest approached us to offer some tissues she were selling. Rather than saying no, dad asked her the baby’s age, and from that, she told us everything about how she was a single parent whose husband left her without notice, making her had to work while taking care of the baby alone. We ended up buying her food from the vendor we were at, as well as bought her tissues. Then she bid her goodbye. Little did we know, her ‘friends’ approached us with the same set. They sold tissues while carrying babies. We guessed that they were in the same kind of business where they accommodated single mothers who had to make living for her and her baby by selling tissues. It was getting late, but we decided to take a delmanride around Malioboro with the intention of buying souvenirs on the other side of Malioboro street the coachman told us. 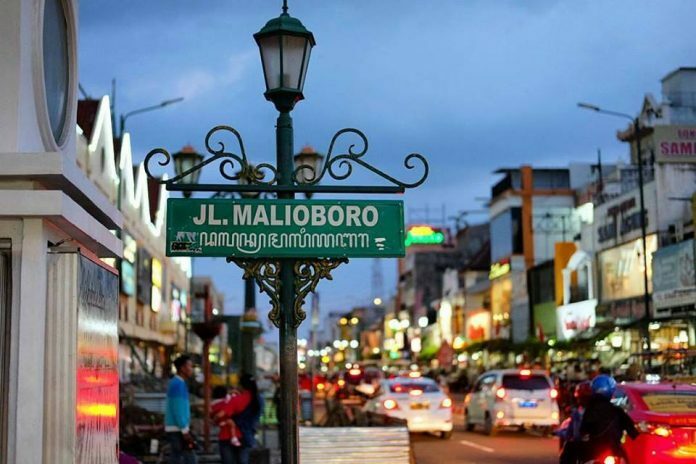 So then we ride along Malioboro street and took turn around the end of the street that led to the surprisingly very quiet side of Malioboro street compared to the main street that was generally boisterous. The coachman told us stories about Malioboro along the ride. On the way back to our hotel, me and dad were walking side by side while Icha and mom were in the same position in front of us. We were discussing about healthy food. Although it’s late, the street were still crowded and loud, and we had our own ‘bubble’ of health topics. I was telling him what supplements I took and what I eat every day to keep my skin and body healthy in the middle of the shouting of souvenir sellers. Dad insisted an alternative and simple way to keep my skin healthy by drinking supplement shake made out of all kinds of beneficial greens that smells like a person’s puke, when mom and Icha randomly entered one of the batik store. Instead of joining the two, we waited outside, talking, still around the health topic and mom would call us two at times, asking us to choose batik for ourselves. I realized that I have so much in common with my dad and I learned things that couldn’t be taught at school. That night taught me that happiness can be found everywhere, and how to be grateful for what we already have. Things that shape us as a person.